Forza 7 and Forza Apex tracks can only be imported with version 3.1n or later. The .zip archives for the tracks need to be unzipped. Note that for the Forza 7 .zip files, the run-time encryption needs removing. The .zips can be decompressed with quickbms_4gb_files.exe (some files > 2GB) , but to avoid file collision each track needs to be in a separate folder. 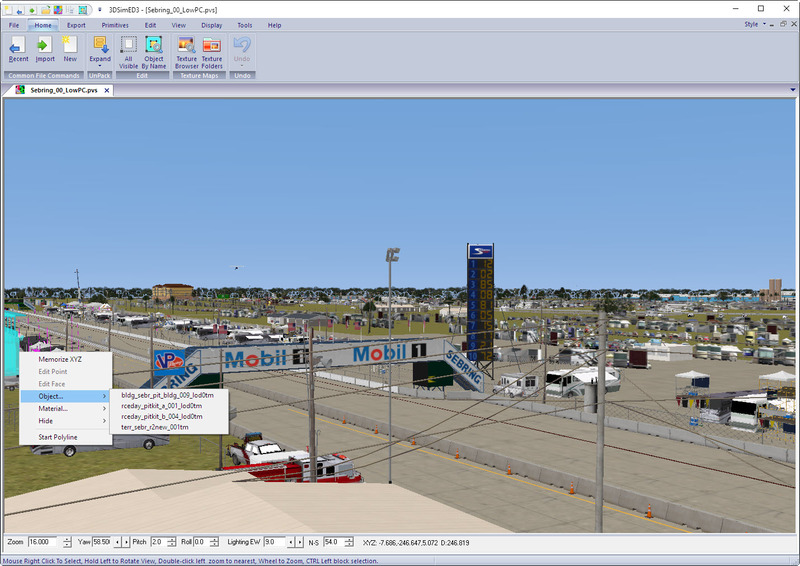 The -D argument should be used with quickbms_4gb_files.exe to ensure each track has its own folder or use a powershell script as explained in Working with Forza Apex car models. Only the archives in the sub-folders of the tracks folder need to processed. To import a track you need to browse and find the track .pvs files. There seems to be little difference between the low, med, high, wet, & night versions. When a pvs has been selected the Track Import Options dialog will be presented. The Quick Convert Swatch to DDS will convert .Swatchbin files to .dds on the fly and place them in a temporary folder. This should not slow the import as the Swatchbin format is very similar to DDS. Most of the DDS will be Directx10 format and because they are not native Directx9 format cannot be stored in ram as compressed data, so they are very memory hungry. 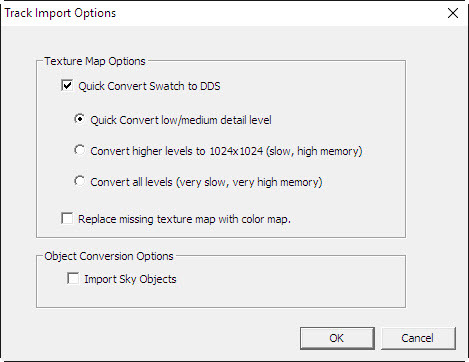 Most of the swatchbin have associated higher resolution versions which can be converted to DDS but these can require so much memory that the track will not be imported correctly so care should be taken with both the higher and all level options. For some reason every track seems to have a few missing texture maps. A solid color texture map replacement will be created with the Replace missing texture map with color map option ticked. The Import Sky Objects option will ensure sky objects are imported but these seem to have little use and merely make editing more difficult.